Outset taught me about the discipline required to start and run a successful business. With a wide range of relatable and practical advice and support from the business start-up experts, Outset Cornwall, a new Latin food business is cooking up a treat throughout Cornwall. 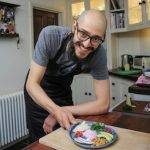 Founder of Casita Lupe, Brazilian born Flavio Silva came up with the idea of creating and selling Latin inspired food after seeing a gap in the street food market while attending summer festivals. “Casita Lupe came about through my desire to serve authentic Latin food at festivals and really give people a different and exciting choice,” Flavio explained. With a background in IT, originally working for IBM in Brazil, Flavio is no stranger to self employment, having already set up a previous business as a bespoke bicycle frame builder. “I have always enjoyed working for myself and if I think there is room in the market for another business then I’m willing to give my ideas a try,” said Flavio. Hearing about Outset Cornwall from a friend, Flavio signed up to the Programme and hasn’t looked back since. Flavio and his team have great passion for the food they cook, sourcing seasonal organic vegetables wherever possible, often from their own allotment in Gwithian. Vegetarian, vegan and gluten free alternatives are also always available. The team have been extremely busy during the summer, attending festivals throughout the county, as well as private parties, events and weddings. As well as the professional advice and support he has received from Outset, Flavio was also successful in securing a microgrant, which has enabled him to purchase additional catering equipment for forthcoming events.